Each day this week, I'll be posting expanded content from my contribution to our church's weekly follow-up devotions. I say 'expanded', because there were simply more thoughts in my head than there was space to submit to the communications director, so these posts will vary slightly from what is available on the app. The plan is super simple, with room to respond and read further as you feel compelled to. You may recall that the focus passage is Colossians 1:24-29, so although each day zeroes in on one or two verses, you may want to read the entire passage each day, for context and clarity. Each week will include thoughts or questions for further reflection and prayer, as well as additional resources for study. I am hardly qualified to teach on most of this content, but there are scholars much smarter than I who have covered many of these issues. I will link to those resources I have found to be helpful or reliable in further research. To “rejoice in suffering” – few things are less welcome in our culture. We rejoice in success, in getting our own way; we rejoice in healing, in winning, in being comfortable. We rejoice in a variety of things that make us happy, but not in suffering. In fact, we usually bristle at the slightest inconvenience. So actual, real suffering? We are indignant. We are grieved. We are frustrated and sure that if we simply had the relief or had the healing, then we could be assured of God’s love for us. But the Apostle Paul butts up against this idea, as do others in scripture. There are several passages that reveal to us a higher perspective on suffering – a holy perspective on suffering. In Romans, Paul builds on this perspective with a strong reminder that suffering is not an end of itself. Believers who experience suffering may also experience the great grace of knowing that the Spirit of God is at work to produce perseverance, character, and hope. A hope that “does not disappoint, because the love of God has been poured out within our hearts” (Romans 5:5). We may not embrace suffering. We may be grieved, broken, or angry with God for its very existence. But the writers of the scriptures encourage us to consider that even in suffering, all is not lost. The love of an infinitely wise God has been poured out in our hearts – and we can hold to hope and hold to Him. This is a mysterious paradox - the idea that we could consider anything beyond comfort, healing, safety, or wellness to be of any value or even something in which to rejoice. And suffering is certainly tricky to address, because it is surrounded by so much grief and anger and loss. I cannot speak with any real certainty or clarity on the ultimate problem of evil and suffering in the world in a way that will "solve" or satisfy the issue. There are brilliant women and men who address the problem of pain and suffering succinctly and with grace - but still not conclusively. As for me, I return with a simplicity of mind to the character of Jesus and His Father. I believe it to be true that God is love. I also believe that God is holy and completely set apart, a perfect and divine Being, without error or flaw, containing and originating within Himself all wisdom. I believe these things on the basis of my study of the scriptures and the hope that the God who authored them was not limiting Himself by using human writers or human interpreters. I also believe this on the basis of my personal experience and that of others. Because I have settled on the belief that God is good, perfect, and holy, I subsequently believe He is capable only of acting in a way congruent with perfect love. I cannot explain how suffering is congruent with love, but the character of God expressed fully in Jesus [also & also] was always about restoration and healing and wholeness. This is a mystery that sometimes I am comfortable with. And sometimes I am not. But believing that God is love allows me to at the very least consider that my suffering and that of others is worth more than I can possibly see or explain. And that ultimately there will be a redemption that will more than do justice for those things we consider as the greatest pains and evils. For Further Reflection: Grief in loss or suffering is a normal and right response. If you are experiencing suffering right now, bring your full range of emotions before the Lord in prayer. Consider interceding in prayer on behalf of others suffering. 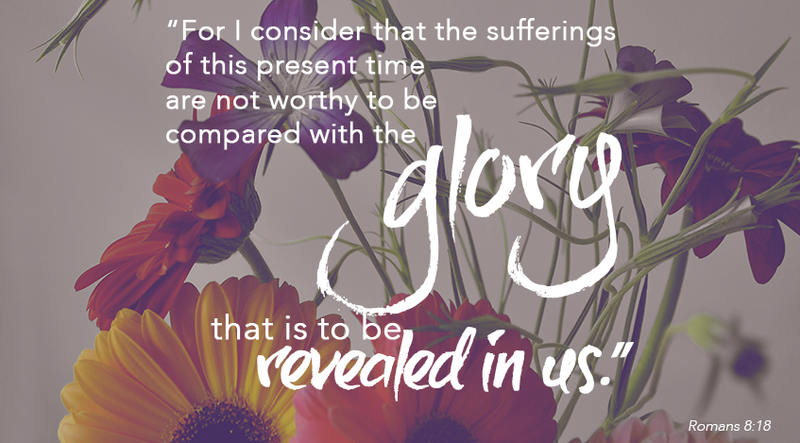 Ask the Lord to reveal His holy perspective on suffering.